Coverslips, chambers and working distance. Microscopy imaging with an objective lens from 1X through 40X at lower resolutions is extremely flexible and can be performed on a very wide variety of samples. However, imaging at higher resolutions, from 40X through 100X objectives, must be imaged through a very thin layer of glass no thicker than a standard coverslip. 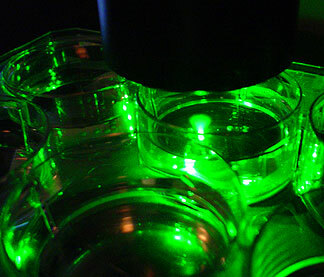 For imaging of living samples, special chambers must be used. The image below is of a mammalian cultured cell line transiently transfected with GFP. The cells were grown on standard 10cm culture plates and imaged with an inverted Olympus microscope. Images of comparable quality could have been attained with cells grown in flasks. The image on the left is phase contrast by transmitted light; the image in the middle is GFP by epifluorescence; and the image on the right is the GFP made green and overlayed on the phase contrast image. The microscope objective used was a 20X planapochromat phase and the scalebar represents 10um. Images were collected with a Photometrics cooled CCD camera. The following image is from the BioRad confocal microscope taken with a 40X phase long working distance objective of GFP transfected cells plated in a large plastic culture dish. However, high resolution imaging, meaning imaging with a 40X, 60X or 100X immersion objective at a numerical aperture greater than 1.0, must be performed through a number 1 1/2 coverslip. For optimal imaging, the cells or tissue should be very flat and sandwiched between a standard glass slide and the coverslip as illustrated. For oil immersion objectives, the coverslip must be fixed in place either by a mounting medium that polymerizes or by nail polish or super-glue around the edges. This method of sample preparation is useful only for fixed and stained material or for some limited applications where the space between the coverslip and slide may be an open chamber. ***** http://www.willcowells.com/ and info@willcowells.com is an alternate supplier of thin glass bottom dishes/wells for microscopy. Their dishes come in many sizes. Make sure you buy dishes with 0.17 mm glass bottoms. Bioptechs sells a variety of specialized chambers for environmentally controlled cell imaging. [Their web site at http://www.bioptechs.com/] Similar products can be found at the Life Imaging Services web site. Mounting cells grown on filters. It's a tough balance between squishing the cells and having too much space. The filter must be sandwiched bewteen the slide and the coverslip with the cells on the coverslip side. One way to play this safe is to sandwich the filter between two 22 X 60 mm coverslips so that the cells may be imaged from either side with a high numerical aperture objective. The filter needs to be squished enough to lie flat and to present the cells near the coverslip but not be squished so much that the cells are too flat. FITC dextran uptake in mammalian cells plated in Mattek dishes; heated chamber on the microscope; 60X N.A. 1.4 objective. High speed 4D confocal microscopy. 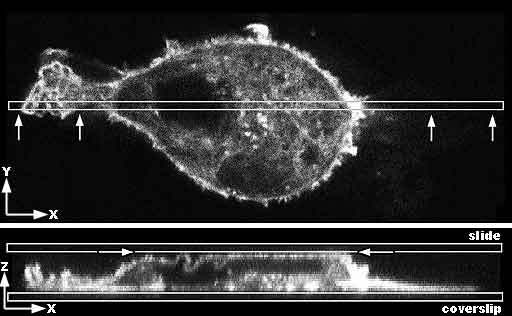 Nomarski (Differencial Interference Contrast) time lapse of cell dividing. Volume rendering of rapid Z series of GFP expressing cells mixed with non-GFP cells. [Quicktime movie 251KB.] Spaces between the bright cells are the non-expressing cells. Plastic slides should be avoided. It is extremely difficult to mount glass coverslips on flexible plastic slides. For proper imaging the clear surface must be flat and uniform; even with aqueous mounting media, plastic slides tend to curve. Plastic slides warp with non-aqueous mounting media as the media is absorbed by the slide. Plastic slides and dishes cannot be used with polarized light techniques such as cross polarization or Nomarki/DIC. Many plastic slides cannot be used with phase contrast. An alternative is to grow cells on coverslips coated with a protein that the cells like to adhere to, such as polylysine, collagen or firbronectin. Do Not Squish Samples When Mounting. Especially for confocal microscopy, where three dimensional morphology should be preserved, it is important to not squeeze the sample when mounting it. Suggested mounting method. Top image: Confocal microcopy single optical section through the center of a mammalian cancer cell stained for f-actin. The box shows where the cell is resampled in the Z axis. The arrows show the view in the bottom image. Bottom image: View in Z axis of narrow slice marked above in a Z series. The cell is growing on and adherent to the coverslip. Due to being mounted too tightly, the slide is pressing on the top of the cell making it flat and forcing some of the membrane at the apical surface to fold to fit against a flat surface. A: Diagram of the cell flattened at the top. B: Diagram of the cell as it shoudl appear in its natural unsquished state. And for some applications, there is the NCO (No Coverslip Option).